The data that lies within biological samples hold the keys to the success of a clinical trial. An important aspect is the collection of samples and their preservation for retesting at a future date. Biological samples often degrade between the time they are collected and when they are tested. It is therefore crucial to have a storage process in place that preserves sample integrity over time. The correct handling of the samples has a big impact on both the course and the results of clinical trials. External biospecimen repositories can act as an extension to your trial's operational and storage needs, ensuring that your project runs as smoothly as possible. Monitoring/alert services: Timely communication and 24/7 monitoring is of the essence when dealing with biological samples. You need to be alerted immediately if there is a problem with a sample or the logistics of the sample. Backup plan: Your samples need to be safe at all times, so having a full contingency plan is crucial. 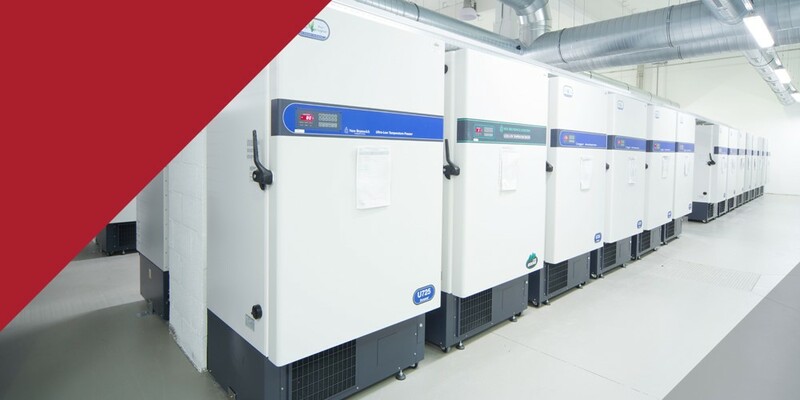 Sample and data loss can be avoided by implementing an efficient backup storage/system powered by emergency backup generators. 21 CFR Part 11 and EU GMP Annex 11 compliance: 21 CFR Part 11 is the part of Title 21 of the Code of Federal Regulations that establishes the United States Food and Drug Administration (FDA) regulations on electronic records and electronic signatures (ERES), while EU GMP Annex 11 is about all forms of computerized systems used as part of European Good Manufacturing Practice (GMP) regulated activities. Experience: Extensive knowledge of identifying, collecting, storing, and distributing biospecimens over time for different clinical trials worldwide is key. High-quality biorepository practices are required to guarantee the integrity and quality of the samples, while providing a cost-efficient solution that supports your clinical trials. With over 18 years of experience in biological sample management, 1,800,000 samples stored in 150 freezers in the US and the EU, CSM is an expert in transporting, storing, and handling biological samples. CSM’s biorepository services include storage infrastructure, flow and location management and data demographics. We offer services ranging from short- and long-term storage of the biological samples collected during a clinical trial to the management of a client's biorepository. Instead of working with multiple vendors, you have one point of contact, one solution and one contract. Our specialty is tailoring the solution to the specific needs and challenges of the client. An example for our custom solutions would be our suggestion for bulk storage, instead of individual storage of samples in certain instances, to ensure that your costs are managed more efficiently, while all your clinical trial needs are met. At our biological sample storage facilities, we use LTSS (Long Term Storage System), a proprietary information tool for storing and managing biological samples, which is 21 CFR Part 11 compliant. We can provide storage of human or animal biological samples to meet good laboratory practice (GLP). The samples are actively monitored and in the unlikely event that there is an issue, clients are alerted via text, email and a call. How can we help your trial? Speak to a CSM expert about your biorepository needs and discover our tailor-made solutions.